Our family has two new members that are stealing hearts and changing minds! We are the proud adoptive parents of two gorgeous pig sisters, Anna and Maybelle, who are putting smiles on so many faces! When our sanctuary opens they will be the perfect animal ambassadors. But until then, you can keep up with their antics at The Daily Squeal. 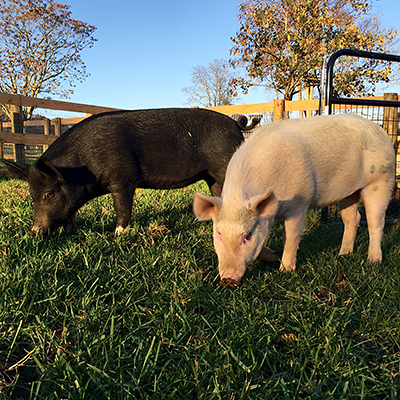 How did two pigs who were destined for slaughter become part of our family? Well it was a long journey that fortunately had this happy ending. When animal activist, Julie Robertson, gazed out of her window while driving a busy road in Georgia in the summer of 2015, she wasn't expecting to see two rogue piglets trotting along the highway. When she first spotted Anna and Maybelle, the piglets were visibly terrified, confused, and exhausted. Anna was limping along with an injured leg, and Maybelle had an infected eye. It was clear that these two little pigs needed to get to safety. Anna and Maybelle were so frightened that it took Julie two days to catch them. Eventually, the girls were so hungry that they allowed Julie to coax them into a crate with treats and whisk them to safety. The pair arrived at her house to a nest made out of blankets. Finally safe, they were so worn out from their ordeal that they headed straight for the cozy pile and were snoring almost instantly. It's believed that Anna and Maybelle fell from a transport truck. Piglets are notorious for squirming their way out of trailers, sometimes falling onto the highway without the driver even noticing. Such a fall can be fatal for young animals, but these two tough girls avoided serious injury, and managed to stay out of oncoming traffic. Most importantly, they managed to stay together, which helped them both survive their scary ordeal. Fortunately Anna and Maybelle narrowly escaped this sad fate, and now they will live out their lives splashing in puddles, squealing with joy, and rooting like pigs should! As I watch them happily run around the pasture running up to greet us, it is never lost on me that had they not fallen off that truck they wouldn’t be alive today. Every day is a gift for and from Anna and Maybelle. When Farm Sanctuary first heard about Anna and Maybelle, they immediately offered them a home at their shelter in New York. This is where our family first met Anna and Maybelle as we had arrived at Farm Sanctuary on that same night. Anna and Maybelle captured our hearts as soon as we met. And soon they had a place not only in their hearts, but in our home! Anna and Maybelle are a parent’s dream. They are cuddly, playful and supportive of one another. They are generous — always willing to offer up their bellies for rubs when you need it. And now the real journey begins. As they regain their health, Anna and Maybelle’s unique personalities are starting to emerge. The friends, possibly sisters, are closely bonded. The girls take great comfort in each other. Each day they are learning to live like piglets: playing, exploring, and even chasing our two children around the pasture, to everyone’s delight. 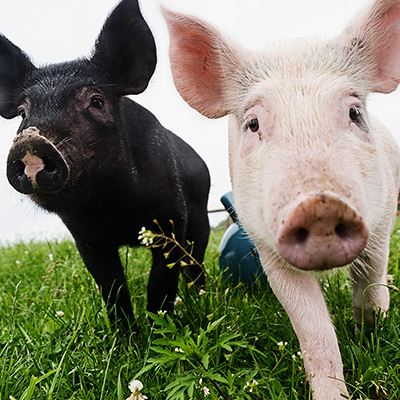 We can only imagine the bright future and fun that lies ahead for these two pigs lucky enough to be rescued. 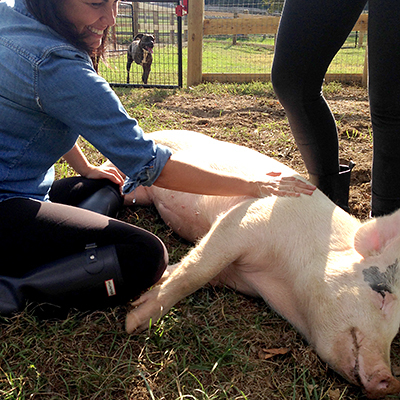 Meet the rescued friends who call Farm Sanctuary home.